The patent-pending, interlocking MAX-Wall system is made to grow and grow as your needs change... it can just go on and on and on, but only if you need it to. Don't buy more than your place requires... and don't bankrupt your pocketbook when a simple MAX-Wall system might be all you need! You want modular? MAX-Wall's your answer. The MAX-Wall’s perfect if you’re renting a space and don’t want to-or aren’t allowed to - mount anything to your walls, or if your place needs to serve a variety of acoustical purposes. MAX-Wall offers you great flexibility in a big hurry. Our 831 Kit (shown here) can serve as an excellent mix position, and in just minutes can be reconfigured to serve as a triangular vocal booth, complete with window! 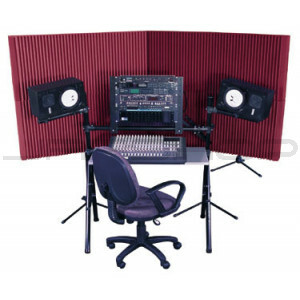 The MAX-Wall is very absorptive, even at low frequencies. It offers great broadband absorption and is incredibly linear, with an overall NRC of 1.05! In our own use and testing, we’ve been amazed at its effectiveness. We ultimately concluded that you get great absorption because all sides of the MAX-Wall panels are exposed, thus doing double - duty. The MAX-Wall’s proprietary, patent-pending design offers excellent broadband control of sound waves throughout your room AND in the near field, so now you can play, record or mix great music or vocal tracks ANYWHERE at ANY TIME! The MAX-Wall panels are thick enough to yield a pretty high degree of sound containment, so a couple boxes of them can be used to set up - in a flash! - a temporary iso booth. Will it yield total sound isolation? Heck no. But it’ll give you enough containment so that you can lay down a clean new track in a hurry and likely not have to monitor on headphones. You can set up your MAX-Wall in minutes with no tools, no adhesive, no fuss. And you can add additional MAX-Wall panels as your needs grow. Start off with one of our kits and go from there. Build your own set-up with additional MAX-Wall 200s, 420s (one box) and other accessories. Add our Stand-Mounted LENRDs or Sunburst-360s to create your own perfect recording environment. For those needing their MAX-Walls to join at 90° angles, we have MAX-Wall CornerCouplers (included in the 1141 VB Kit; 12 - 20” sections per box). The MAX-Wall mounts on our MAX-Stands™ that have an extension, allowing you to raise it to a height of 8 feet. You’ll also receive MAX-Clamps™ to place under the panels for added support.